Aggregame Blog: PAX vs E3... In Tweets! The official blog for Aggregame.com. Find the latest news, status, and feature updates for Aggregame, AggreTweet, and any associated products of Aggregame! PAX vs E3... In Tweets! Some rather interesting data came through the tubes this week. As most gamers know, PAX Prime in Seattle wrapped up over Labor Day Weekend, and thus closed another chapter in 2010's video game convention schedule. What most of you probably don't know, is that PAX yielded a fraction of Twitter chatter compared to E3 2010 earlier this year, despite drawing higher attendance figures than E3. But how can that be? PAX Prime 2010 saw record attendance figures - over 67,000! Meanwhile, E3 2010 had a mere 45,500 attendees... What does this say about Twitter, gamers, and the respective conventions? That's what we at Aggregame are pondering today. Now, in PAX's case, we grabbed the most ideal window of time (tried to give them to benefit of the doubt), so we gave them one extra trailing day (which saw more tweets, but ultimately the difference was negligible). 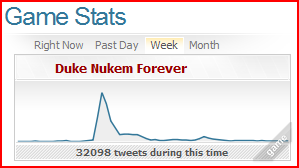 Still, their total Tweet count for the week ended just over 78,000 Tweets. Of course not every tweet was literally tweeted by an attendee of these conventions; plenty of onlookers contributed to the chatter. Nevertheless, if you measure the value of an event by social media chatter - "Tweets per Attendee" - PAX doesn't hold a light to E3. How do you think Publishers and Developers should (and do) look at the value of a trade show? Should they care about the 40k - 60k attendees? Is that what they invest their Millions of marketing dollars towards? Or are they looking for that mass viral chatter that proliferates from such an event...? We suspect it's the latter... In which case, why would any Publisher or Developer want to take part in PAX, when E3 clearly generates way more hype? Perhaps we're being a bit harsh on PAX. After all, E3 2010 had a far more powerful lineup of games at their show. Certainly that has a direct impact on number of tweets about an event. Of course "Electronic Entertainment Expo" is also better known, has a longer history, and is sort of the de facto trade show to be compared with. So we're going throw down the gauntlet right now: How well do you anticipate the Tokyo Game Show (TGS 2010) will hold up against E3 and PAX? TGS is THE largest video game trade show in the world, dwarfing all other attendance figures. Is it as well known in the Twitterverse, though.. That is the question. We'll find out later this month! 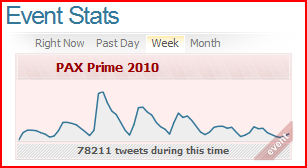 That's right... Just about half the Total Tweets for the entire PAX Prime event channel, for one game. Just sayin'! Neste inverno venha conhecer as Pousadas de Campos do Jordão, uma atração a aparte na cidade mais linda do Brasil. Aggregame.com is a social media platform for Gamers. From user-submitted content, to gaming-news aggregates for news discovery; Aggregame.com serves as a one-stop shop for all things gaming. The innovative new AggreTweet.com is a great way to stay on top of the latest real-time social news as-it-breaks over Twitter.